Our Deluxe Port and Stilton gift is a perfect choice for those who adore special port and award winning Cropwell Bishop Blue Stilton. Included is a very fine Vista Alegre fine tawny port made with specially selected grapes grown in Portugal&apos;s northern Douro valley. Presented in a leather case with cheese knives and a waiters friend. 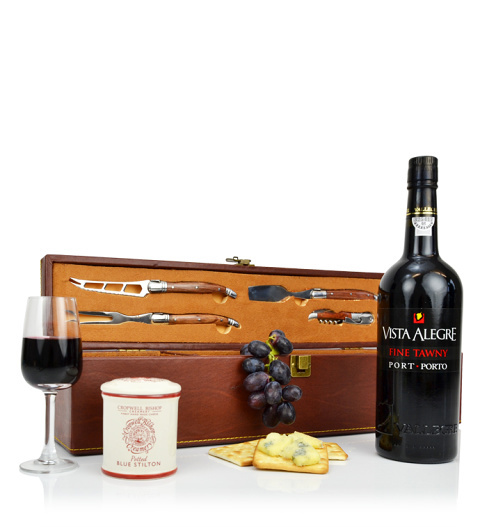 Our Deluxe Port and Stilton gift is perfect for this Christmas and is available for UK next day delivery. Box colour may vary.